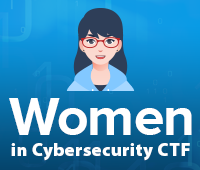 Women in Cybersecurity CTF Competition is the first cybersecurity competition in the MENA region for women. This is Competition where participants can show their technical ability in the cybersecurity field.Today, we face a huge shortage in cyber security talents and with 20% only of world wide workforce are females, the need for adding more women to the cybersecurity game became so crucial to close the skills shortage gap. This is a female only competition. Only Females are allowed to join the competition The Competition is allowed for both students & professional. Team formation (2 or 3 players).